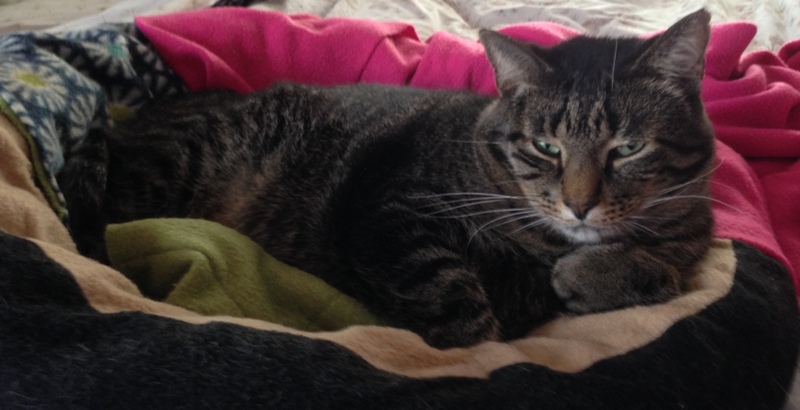 Okay, it’s been beastly cold…so cold that the usually overly warm human has been complaining. But she had a coupon and a plan. It was time to go dig through the remnants bin at the local fabric store and see if there might not be some plush fleece pieces that could add additional warmth to kitty beds. As luck would have it the remnants bin, which already is 50% off the usual price of the fabric, had a pre-Thanksgiving sale with an additional 50% taken off the marked price. That meant fleece at 75% off. 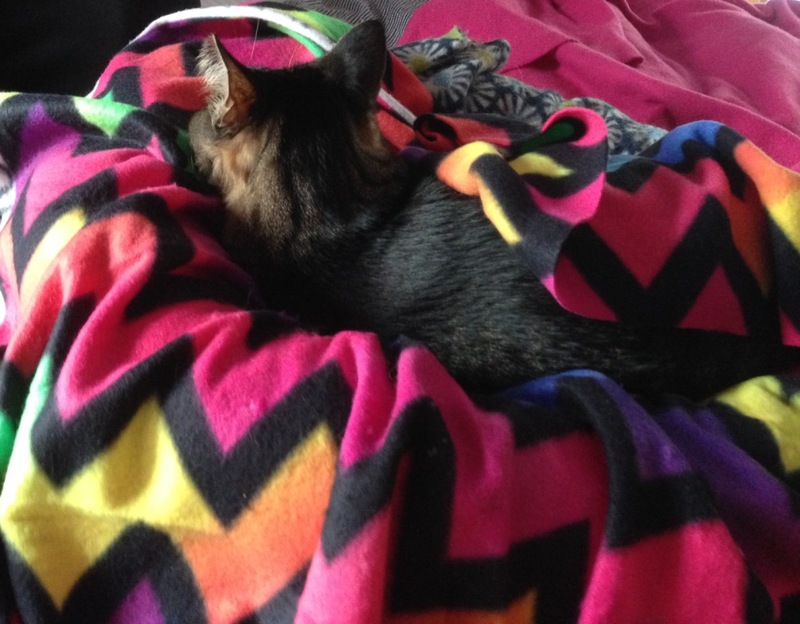 The human bought a whole bunch of small pieces in bright, fun colors and patterns and distributed them to kitty cuddles around the house. So far, the reception among the 4-legged clan has been quite positive. 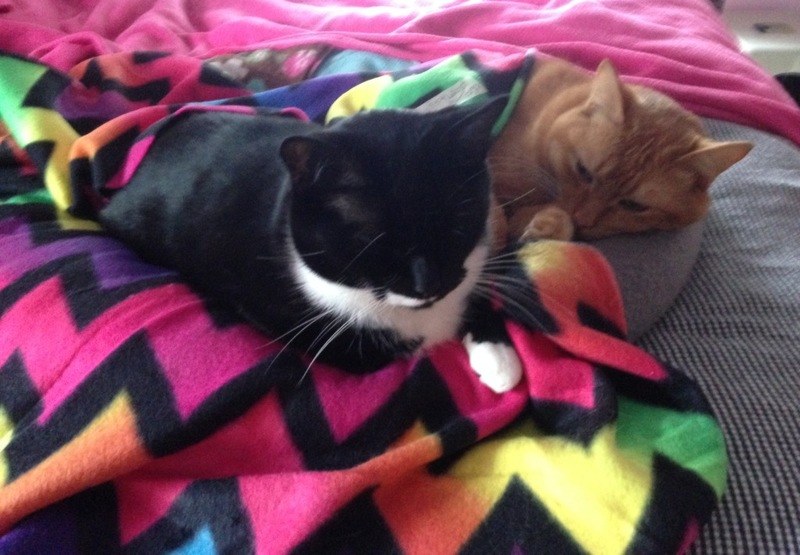 Now the kitties are better prepared for cold weather, not that they don’t love fleece at any time of year, and the human is cheered by all the bright colors lying about. In any event, doesn’t he does look regal, like the emperor kitty that he is? 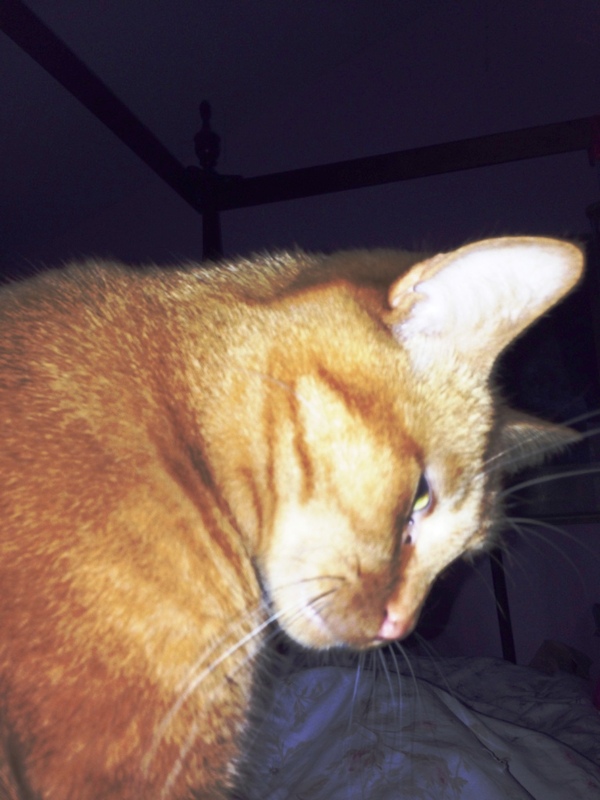 The human had a hard time falling asleep last night, so wasn’t terribly energetic about getting up early this a.m. That means that when my Little Red Ruu bounced onto the bed to wake me up this morning, he decided to stay and cuddle instead. With the colder weather, I coaxed him off my shoulder (I was lying on my side) and onto my pillow, where he proceeded to curl up around my face and began washing my fingers energetically. (It’s a wonder I have any skin left.) After he’d assured himself my fingers were clean, and after I’d petted him sufficiently, he curled up around my head, licked my eyebrow, and then put his head on mine and sang me a song. It was a very sweet 15 minutes with my face buried in his soft tummy fur. Of course, the Baby Comet is quite energetic and doesn’t sit (let alone lay) still for very long. All too soon up he bounced ready to check out other interesting things besides the boring recumbent human. Just before he dashed off for adventures on his own, I snapped this pic.